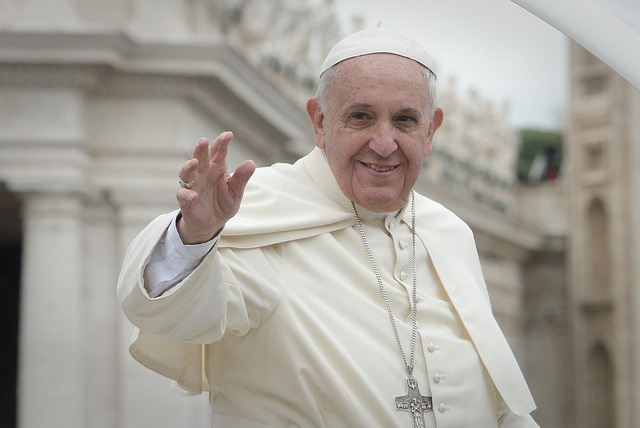 Home Blog What are you hoping for when Pope Francis comes to the US? During his General Audience today, Pope Francis spoke about his quickly-approaching journey to Cuba and the United States. I’ve read for months about the trip, and will be covering the World Meeting of Families portion for National Catholic Register, but it didn’t seem fully real until I read the Holy Father’s remarks. Next Saturday I will depart for an Apostolic Voyage to Cuba and the United States of America, a mission to which I am going with great hope. The principle reason for the Voyage is the Eighth World Meeting of Families, which will take place in Philadelphia. I will also be going to the central headquarters of the United Nations on the 70th anniversary of its institution. Even now I greet with affection the Cuban and American people, who, guided by their pastors, are spiritually prepared. I ask everyone to accompany me with prayer, invoking the light and strength of the Holy Spirit and the intercession of Mary Most Holy, Patroness of Cuba as the Virgin of Charity of Cobre, and Patroness of the United States of America as the Immaculate Conception. This is a mission to which the Holy Father is going with great hope. I think we’re all filled with hope, for so many things. That through this Papal visit, and through the World Meeting of Families, we – not just those of us attending, but worldwide – become reinvigorated for our Catholic faith and more fully committed to fostering and protecting holy families. Papal Visit, Pope Francis, World Meeting of Families. Bookmark.